Succulents and cacti are one of the most popular decorating trends today. Not only do succulents add a bit of tropical greenery to their surroundings, they are also quite sustainable and easy to keep alive. You can freshen up your living room decor with succulents, or use them as luscious additions to your wedding decor. With their incredibly diverse repertoire, here are a handful of ideas on how to decorate with succulents. Care for a shabby-chic look at your wedding reception? Why not showcase a purple-tinged succulent blossom in a lovely, glass display case. This cheerful, spring-inspired look is simple, stunning, and easy to replicate. For this succulent decoration, start with a wood slab base with bark fringing the edge. For an arrangement that will stay fresh all day, utilize an artificial echeveria blossom as your succulent focal point. Place the blossom in the center of your wooden circle, and place a glass cloche on your wood foundation, encapsulating the succulent (make sure the diameter of the cloche is less than that of the wooden circle). Next, surround this feature with LED votive candles and a pastel bouquet of preserved rose heads in a birch bark vase. Photo via Southern Weddings . Incorporate the luscious colors of a tropical rainforest to your porch or pergola with a cage full of cascading greenery. This succulent decoration idea is perfect for summer evening kickbacks or barbeques. 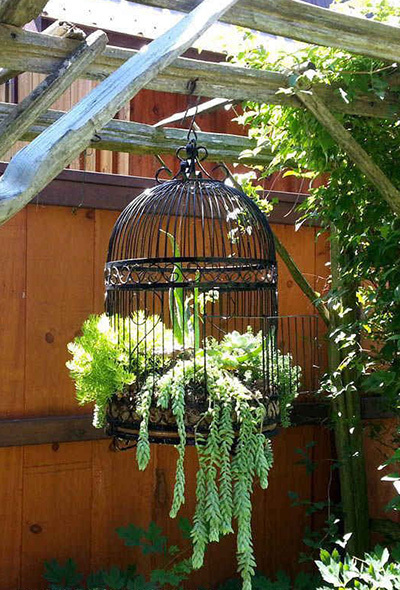 Recreate this look by utilizing a vintage metal birdcage as your vessel. Fill the bottom of the cage with clumps of preserved moss that acts as a securing agent for the succulents. Next, choose a mix of artificial succulents to secure in the moss. You can try a few spikey stems to adorn the inside of the cage. Select garlands, sprays, and longer strands, so that you can cascade them down between the cage railings, giving your display an overgrown appearance. This textural ornament can be hung from a pergola rung, or a porch overhang. Photo via Empress of Dirt . Perfect for your work desk or shelving in your home, this custom terrarium is an easy way to incorporate succulent decorations into your every day life. 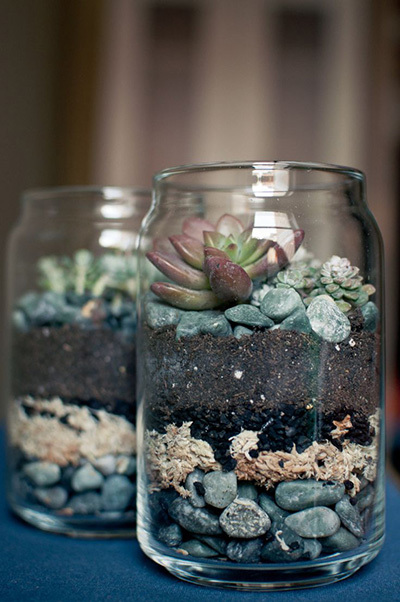 To create a jar terrarium, start with a quart-size mason jar. Fill up the bottom with a few inches of porous pebbles. Next, place a thin layer of moss atop the rocks, followed by potting charcoal and soil. Sandwich your earthy striation with another layer of pebbles. Finish off your display by securing an artificial succulent blossom among the stones. Photo via Oh Lovely Day . Add a beachy touch to your landlocked home with this inspired decoration. This succulent decoration idea will wonderfully embellish your front or back porch, bringing to it a touch of greenery and marine-esque beauty. 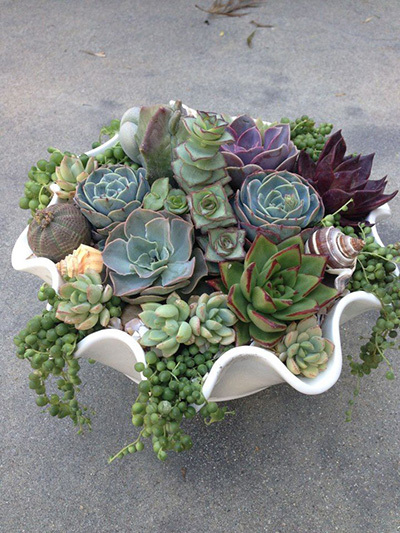 Create this potted plant look with a large clam shell bowl. Utilize a resin piece with authentic qualities, as it will be durable and stay lustrous through every season. Next, fill the bottom of the bowl with several inches of micro pebbles or sand, which will stabilize the succulent blooms you arrange in it. Select large and texturally diverse succulent blossoms to assemble in the bowl. Include a spikey head, large and small echeveria blooms, and agave blossoms. 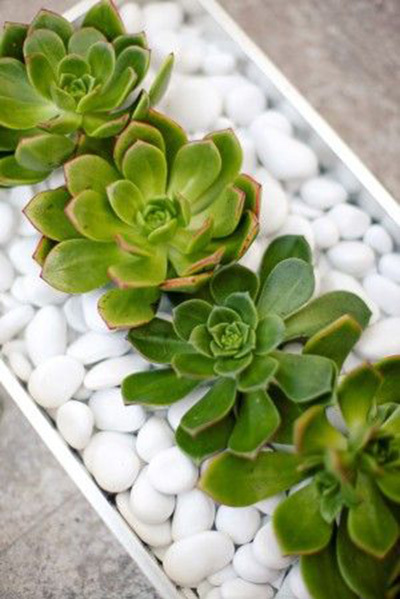 Fill in any extra space around the outer edges with sprays, such as donkey tail and succulent pearl. Finish off your luscious bowl by embedding a few conch shells among your blossoms. This dainty centerpiece or tablescape arrangement will work well with both modern and vintage decorative schemes, as it incorporates elements of each. 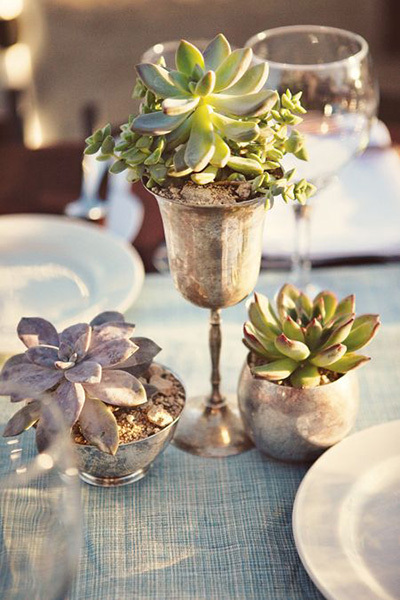 For this flashy succulent decoration, use a linen table runner as your foundation. Utilize a rose gold mercury glass compote as your focal point. Cluster around it smaller votive candle cups with antique, metallic finishes. Fill the cups with soil or earthy pebbles, and secure mini echeveria blossoms in the smaller holders. Place a few, varied succulent picks in the compote, allowing them to fan out a bit for an eye-catching touch. If you lean more towards minimalism, this succulent decoration idea is made for you. Recreate this crisp, stunning, and simple design with a handful of organic pieces. Utilize a rectangular clear glass vase as your sleek foundation. Fill your vessel with white cobble stones, incorporating stark color and eye-catching detail. Finally, secure several artificial succulent blossoms in the stones, creating a linear, uniform look. Purpose this decoration as a centerpiece on a long banquet table or as a stunning fixture on your mantelpiece. 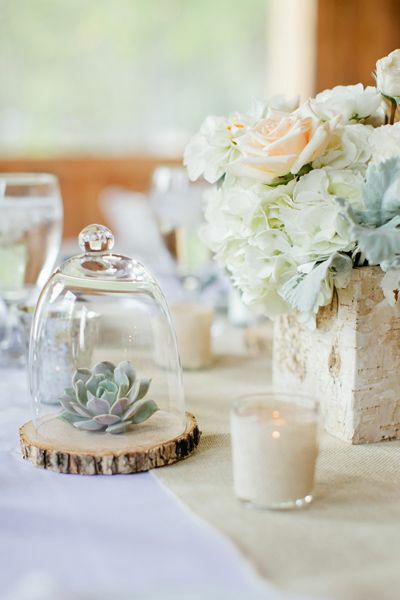 Fashion eco-friendly centerpieces with the help of succulents and cheerful bud vases. 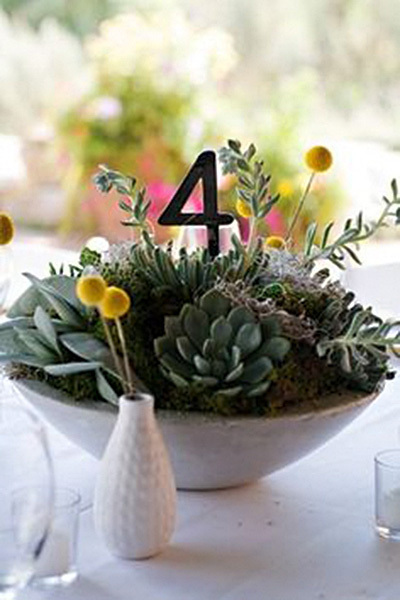 This succulent decoration idea doubles as both a centerpiece and table number, and will compliment your outdoor wedding reception. Recreate this organic look by starting with a large concreteor silver bowl. Partially fill the bowl with preserved moss to act as a filler and bed for your luscious succulents. Arrange a handful of large, artificial echeveria, kalanchoe, and agave blossoms in you bowl, and garnish with a leafy succulent bush pick. Place a wooden table number among the blossoms. Finish off your stunning decoration with a few bud vases filled with dried yellow thistle stems, cut to size. Add a creative, attention-grabbing decoration to your urban loft with these glassy orbs. To make this succulent decoration, start with hanging glass terrariums of different sizes, which have the look of sparkling bubbles. 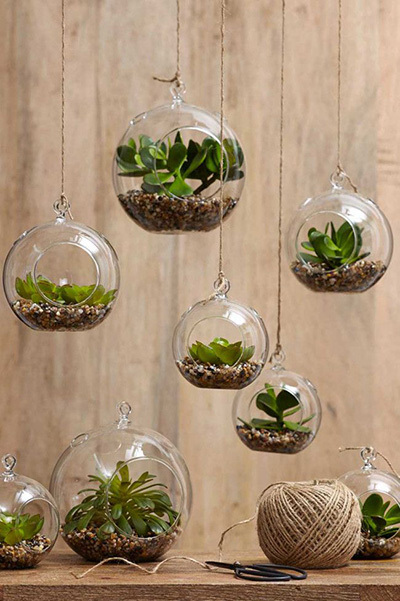 Fill the bottom of each orb with glass pebbles, and select small artificial succulent blossoms (cut to size if necessary) to secure in each sandy-bottom terrarium. Finally, string these globes on sturdy twine, varying their lengths so that they will have a floating appearance once hung. Add a touch of southwest sizzle to your bedroom or studio with this cactus and succulent decoration. This arrangement will add an edgy look to its surroundings, and immediately liven up its space. Create this look with artificial cacti and leafy succulents. 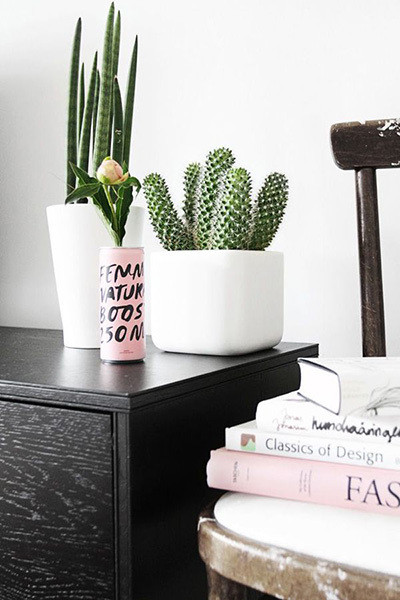 Select a life-like potted cactiarrangement in a white or light gray container. Next, choose a white pot or bucket and place a tall artificial tall plant inside. The light vessels will pop against the vibrantly green plants or grasses inside, and add fresh detail to your desk, end table, or shelving. Photo via Home My Design. Create an indoor garden with the help of graceful teacups and saucers. This succulent decoration makes for a thoughtful Mother’s Day gift or tea party embellishment. 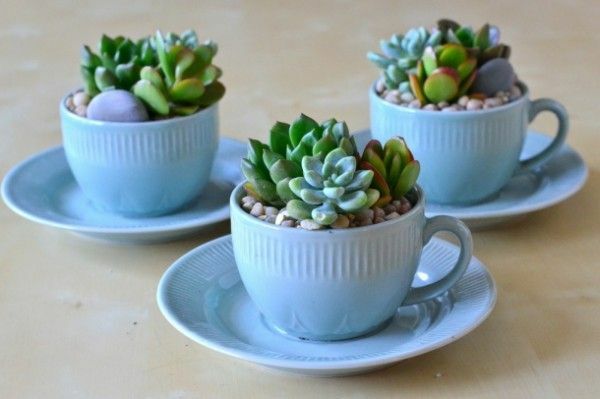 Fashion this adorable decoration by using sky blue teacups and saucers as delicate vases for your succulent garden. Fill each cup with decorative agate stones. Then, secure tiny artificial succulent blossoms and sprays (cut to size) in each cup. Display these cutesy cups on your countertop or windowsill to bring a cheerful ambience to your kitchen.